I just bought a graphics tablet, I'm new to computer design and have always drawn with traditional media. 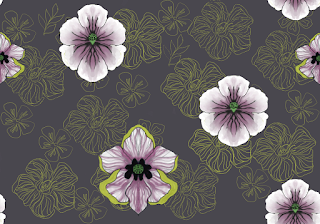 Creating on a tablet with artist software is really fun, though, there is a serious learning curve! I am using Painter 12, and teaching myself to use layers and color and tools galore. Mod Dandelion is my first official solo fabric design, for the Mod Wallpaper contest on Spoonflower. I feel like a whole new wonderful world of design has opened up!